Sadly I had very little time to work on the project last week because I had to be out of town for the most part. Despite of this setback though, there was a significant improvement, which is the user review widget. What this means is: Screenshot time! 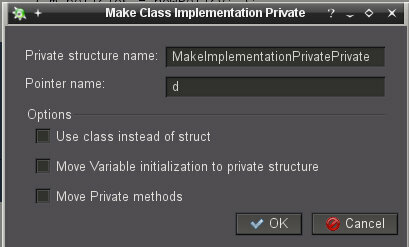 Here I will be using the half-complete Private Implementation(Which takes a class, and converts it's private members to the PIMPL idiom) generator. By clicking Ok, the changes will be commited to the disk. Last week of GSoC will be used to finish up the generator, and documentation on the tools available for automatic code generation. 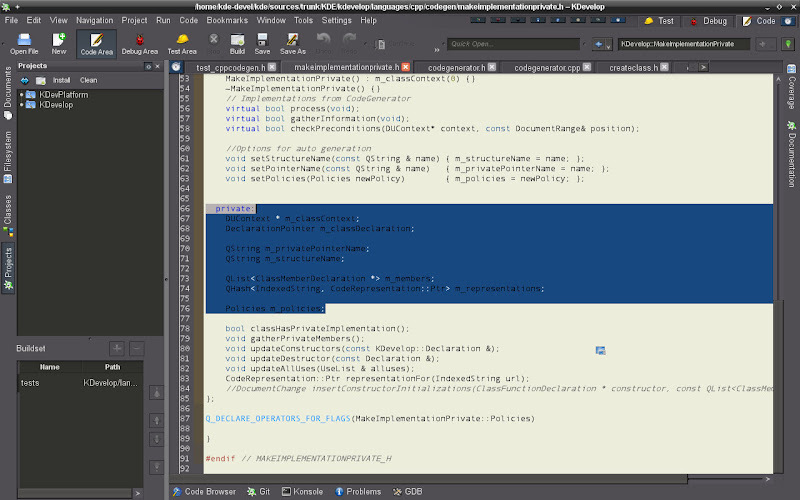 The number of times I've had to do that bit of refactorization is just too annoying. A bit of a bugger that Kompare part requires trunk (4.4, I presume). 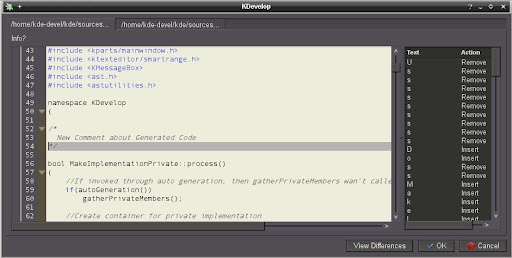 I don't mind running KDevelop from svn (soon git, I hope :D ) but kdelibs is a bit too critical for me to run directly from svn. I don't know what your use case is, but for what it's worth I've been running all of KDE from SVN for nearly a year now, and the number of problems I've had (besides occasional compilation issues -- in which case i just keep using the previous revision, no big problem) is very close to zero. Or at least, I cannot remember a single one. 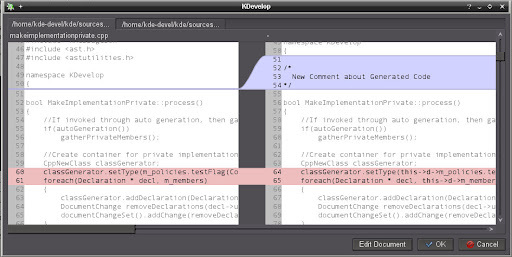 With some projects, building from SVN/CVS/git just means you get the bugfixes sooner.